I am passionate about eating a stick of celery nearly every day. This simple stalk provides a bundle of goodness. You won’t believe how amazing it is! First – it alkalises the body. It helps prevent your body from becoming too acidic, something associated with pre-cancerous states. Tick this box! Second, it can help reduce blood pressure. How? By relaxing the nerves, which can prevent (emphasise prevent..) migraines. Start adding celery to your diet from now on if you have HBP or migraines! Just one or two sticks will make all the difference and PERSEVERE! Celery is rich in organic salt, which means it can help dislodge calcium deposits from the joints. This calcium deposit makes your joints feel stiff. Then it holds the dislodged calcium in its watery solution, takes the deposits on to the kidneys to be excreted in urine. Flushes out toxins as well. Anther big tick for this! Fresh celery juice is one of the most healing powerful juices I can think of. Just 16oz of fresh celery juice a day can transform your health. You may begin to notice the changes within a week. (There is a warning about overdoing juices at the end of this blog). Read on! Vitamin A is a big part of it’s healing properties. This is the wonder vitamin for healing the ‘leaky gut’ (gastrointestinal permeability). Health starts in the gut and in particular the small intestines. Making sure your guts are well is one of the most important health creators I can think of. One warning. A celery juice a day can be health giving but certain compounds in celery can create a ‘goitrogenic effect’ – translated loosely, it can slow thyroid function. Everything in moderation. Get that! 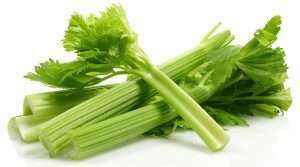 celery contains apigenin, a molecule gaining interest for its possible anti cancer effect. Apigenin is found in parsley, thyme and chamomile, plus other herbs. It enhances neurons in the brain. Eating foods with apigenin helps lower inflammation, the big factor behind most of todays health problems. Short summery. Eat a stick or two, crunch away, or juice a few and drink on an empty stomach. Vary your diet. Some days, do without! Eat/drink from the abundance of other green veg we have. Best foods for the brain!?? ?